So, Nigeria's Now Highest Rice Producer in Africa? 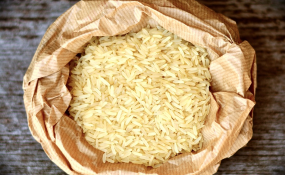 Despite the fear of a shortage of rice in 2019 due to flooding incidents last year, Nigerian farmers have said the early rains in the country's rice-growing regions had boosted prospects for a good harvest. The Minister of Agriculture and Rural Development, Audu Ogbeh, had earlier predicted a shortage of rice in the country if appropriate measures were not taken to replant after places like Jigawa, Kebbi, Anambra, and Kogi were affected by the flood. Bloomberg quoted the president of the Rice Farmers Association of Nigeria, Aminu Goronyo, as saying "We have experienced early rains in the central states and the northeast, from all indications, we expect a bumper harvest thanks to favourable weather." The boost increases the likelihood of lower import by the country as Nigeria's rice importation figures kept reducing since 2015. Nigeria currently produces 4.8 million metric tons of the grain a year and must import the balance to meet domestic consumption estimated at more than eight million tons a year, according to the U.S. Department of Agriculture. Nigeria's Agriculture Ministry insists local output has reached seven million tons a year, with the government expecting to cut as much as 1.9 million tons of rice imports next year. Rice farmers are getting government support through a program backed by the Central Bank of Nigeria to provide them with low-interest credit, helping draw more farmers to the crop, according to Mr Goronyo. Is Nigeria Self-Sufficient in Rice Production, Consumption As Buhari, Osinbajo Claim?